Need a Muirfield photo ID card? Stop by tonight until 6:30 p.m. It only takes 3 minutes per card and you can pick up your pool guest passes at the same time! If you miss us tonight, the final after-hours date will be Tuesday, May 23, until 6:30. Otherwise, we're open every business day from 8-4 to issue cards. Muirfield Association is pleased to pass on the following information about the FORE! Miler race. Please download and read the official three page letter which includes information about road closures. The contents of the letter and race map are below. This letter, which has been mailed to 2,000 Dublin households, is just one of many ways we are notifying residents of the road closures and the opportunity to participate as a runner or spectator. Information also is being shared through social media, websites, the Dublin Villager and neighborhood associations. Please feel free to contact [email protected] with any questions or concerns, or visit www.foremiler.com for updates and information. If you would like to contact the City of Dublin send an email to [email protected]. With 3,000 participants anticipated, a big community event such as this affects all of the surrounding neighborhoods, and we appreciate your support and understanding. Traffic will be temporarily detoured around all race areas from 6:30 to 8:30 p.m. on a rolling basis. City of Dublin Police Department will provide traffic control during the race. Please speak to an officer on site if you require assistance. Officers will be able to provide detour information and will strive to permit vehicular traffic to cross closed intersections when such an action can be safely accomplished. We invite you to join us in this community focused event. Help cheer on the runners or register to run or walk at www.foremiler.com. We are extending to you a $5 discount for the event by using the code “17DUBLIN5”. The FORE! Miler is a 4-mile road race for runners and walkers that will kick off the 42nd playing of the Memorial Tournament presented by Nationwide. This charitable event will highlight and benefit the alliance between Nicklaus Children's Health Care Foundation and Nationwide Children's Hospital. Last year’s race raised $40,000 for Nationwide Children’s. After the race, runners and walkers will enjoy a free Post-Race Party at the Golden Bear Club, an enclosed, climate-controlled venue located between No. 10 fairway and No. 14 green at Muirfield Village Golf Club. The FORE! Miler is limited to the first 3,000 runners and walkers. All race Participants will receive an official FORE! Miler Technical Race Shirt, an official FORE! Miler Finisher’s Medal, one complimentary Any Day Practice Round Ticket ($35 value), valid for use any one day of your choice Monday - Wednesday to the Memorial Tournament presented by Nationwide and a complimentary adult beverage (21 and over) at the Post-Race Party. FORE! 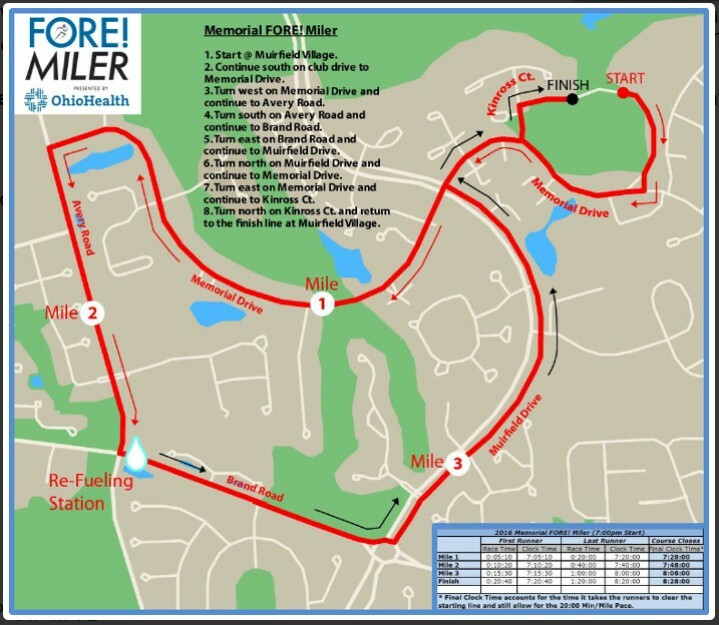 Miler’s presenting partner, OhioHealth, is a leader in health and wellness in central Ohio and shares a common vision with the Memorial, M3S Sports and City of Dublin to improve the health of the community. Thank you in advance for your cooperation and patience through any inconvenience these temporary road closures may cause. We look forward to seeing you at the FORE! Miler and the Post-Race Party. Please feel free to contact [email protected] with any questions or concerns or visit www.foremiler.com for updates and information. Registration limited to the first 3,000 runners & walkers. Contact [email protected] or visit www.foremiler.com for updates and information.